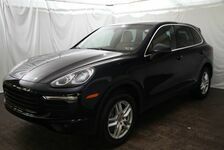 This 2018 Porsche Cayenne Platinum Edition is proudly offered by Porsche Pittsburgh. With the Porsche Certified Pre-Owned Warranty, this vehicle will have manufacturer-backed warranty coverage until November 27th, 2023. The "Platinum Edition" is a special trim that celebrated the final years of the previous-generation Cayenne, sporting 20" RS Spyder Design Wheels in Platinum Satin with the wheel arches color-matched to the exterior finish. In this case, the car has a vibrant Carrara White Metallic finish with a leather Black/Luxor Beige interior. Premium appointments like a Panoramic Roof System, Porsche Entry & Drive, and the Premium Package with 14-way Power Seats highlights a car that looks as good as it drives. Why wait? 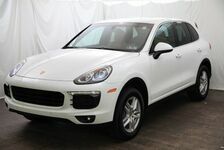 Come make this Certified Pre-Owned 2018 Porsche Cayenne Platinum Edition yours today!